NETWORK FINALS: The season premiere of 20/20: IN AN INSTANT lost 0.1 in final numbers. CABLE HIGHLIGHTS: Showtime ran a “sneak preview” of I’M DYING UP HERE with little publicity and earned a rating of 0.03/102K. Sports occupied the top of Saturday cable, with NBC Sports Net’s STANLEY CUP FINALS at 1.00 and Fox Desportes UEFA FINALS at 0.55. (HBO, as is its practice, listed the premiere of the theatrical MISS PEREGRINE as an “original,” with a so-so 0.45.) Nickelodeon’s 10AM SPONGEBOB hit the day’s Top 5 at 0.41, and lead-out ALVIN & THE CHIPMUNKS wasn’t far below at 0.35. A&E’s 3-hour LIVE PD returned from a Memorial Day weekend holiday at 0.40. Adult Swim’s late-night line-up performed as follows: DRAGON BALL Z down 0.08 from 2 weeks ago to 0.40 (the primetime DRAGON BALL SUPER was down a tick to 0.32), ATTACK ON TITAN down 0.06 to 0.31, TOKYO GHOUL down 0.02 to 0.28, HUNTER X HUNTER down 0.01 to 0.25/474K, MOBILE SUIT GUNDAM down 0.02 to 0.23, NARUTO steady at 0.24/438K, and GHOST IN THE SHELL steady at 0.20/380K. Fox Sports 1’s UFC PRELIMS coverage was at 0.29. Hallmark’s original movie DESTINATION WEDDING was at 0.29. HGTV’s BEACHFRONT BARGAIN HUNTERS was down a tick from last week to 0.28. 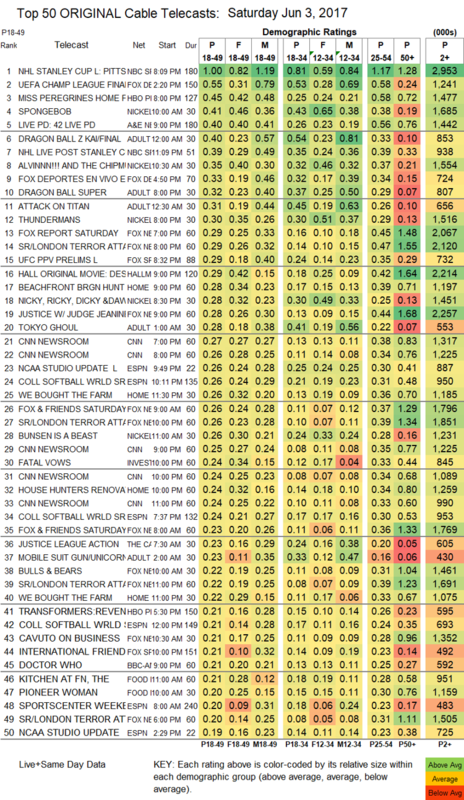 On BBCAmerica, DOCTOR WHO climbed 0.06 to 0.21, and the finale of CLASS held at 0.06/223K. On Food Network, KITCHEN AT FN ROSE 0.03 TO 0.21, and PIONEER WOMAN slipped 0.02 to 0.20. On TLC, NATE & JEREMIAH BY DESIGN aired back-to-back episodes at 0.10/0.15, compared to 0.17 2 weeks ago. OWN’s IYANLA FIX MY LIFE dropped 0.08 to 0.13, while BOOK OF JOHN GRAY was up 0.01 to 0.12. AMC’s THE SON returned from a week off down 0.02 to 0.12 (the Sundance simulcasts appear to have ceased).